We reported back in April that the premiere showing that takes place when FXX hits the airwaves is going to be the longest running marathon in all of TV History. Read that article here. What show could even come close to having that many episodes to run so long it breaks a record? Well, duh, it’s ‘The Simpsons“! FXX will begin it’s broadcast with season one of the animated comedy, including ‘The Simpsons Movie‘ all in chronological order from 10 a.m. August 21 through September 1 at 12 a.m. I know I couldn’t make it that long! 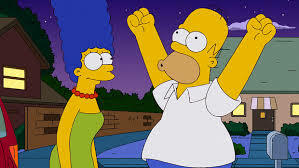 Once the new begins to wear off of the fledgling channel, they will launch ‘Simpsons World‘ in October. It has been described as “the ultimate ‘Simpsons’ digital experience” allowing authenticated viewers to have on-demand access to every ‘Simpsons’ episode through www.simpsonsworld.com and the FXNow apps on many movile phones, tablets, smart TVs and a variety of other devices. Using the site, fans will be able to create personalized playlists, share clips and explore the town and people of Springfield. Basically, this is going to be an all Simpsons channel. At least that’s what it sounds like to me. After the big marathon watch, FXX is going to be planting mini-marathons every Sunday from 4 p.m.leading up to the show’s new broadcast on Fox at 8 p.m.
I’m betting a good chunk of money was transferred and all involved found this agreeable, Gracie Films Production, 20th Century Fox Television. James L. Brooks, Matt Groening and Al Jean are the executive producers. Matt Groening and Netflix Team Up for New Animated Comedy Series! This entry was posted on Tuesday, July 22nd, 2014 at 11:40 pm	and is filed under News, Television. You can follow any responses to this entry through the RSS 2.0 feed. You can skip to the end and leave a response. Pinging is currently not allowed. « Idris Elba Casts A Spell on Warner Bros. With ‘King Arthur’ re-make!! !